www.datoavisos.com.ve » Estado de Mérida » MUCUCHIES » Electrónica Audio Video » Audio Profesional DJ » Mixers y Consolas / Martes 26 de Octubre del año 2010 / 1:22 Horas. This CDJ package combines excellent performance and features with USB integration, MP3 playback, MIDI support and much more - all packed in a look that flat out works - case closed. The special edition CDJ-400, DJM-400 and matching Pioneer DJ coffin are only available on pioneerelectronics and supplies are limited. So don’t delay taking advantage of this unique opportunity. This exclusive blue cobalt case is specifically built for the limited edition CDJ-400-K and DJM-400-K pro DJ combination. 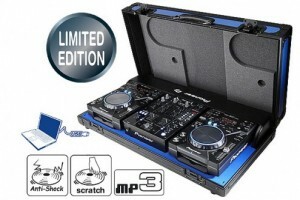 This matching colored case cannot be purchased anywhere else in the US and is emblazed with a Pioneer DJ Logo. Built to the highest quality it will house two CDJ-400-K CD decks a DJM-400-K mixer and has a dedicated space for two USB memory sticks. This official Pioneer case comes with more than adequate padding and strong lockable catches. So rest assured your unique DJ products are safe.